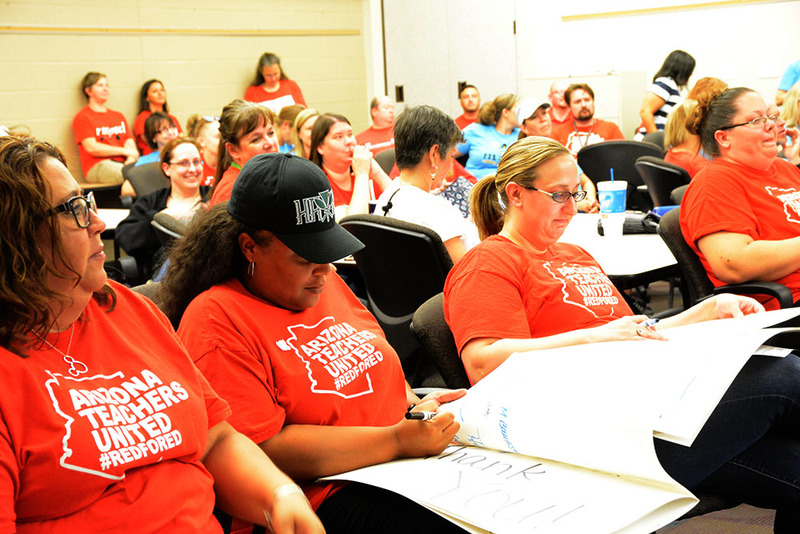 As if putting a stamp on an energetic evening featuring scores of #RedForEd T-shirts, the Maricopa Unified School District Governing Board expressed their support as the teaching staff prepared to join a statewide walkout to change education funding. MUSD school closed Thursday and remain closed Friday. 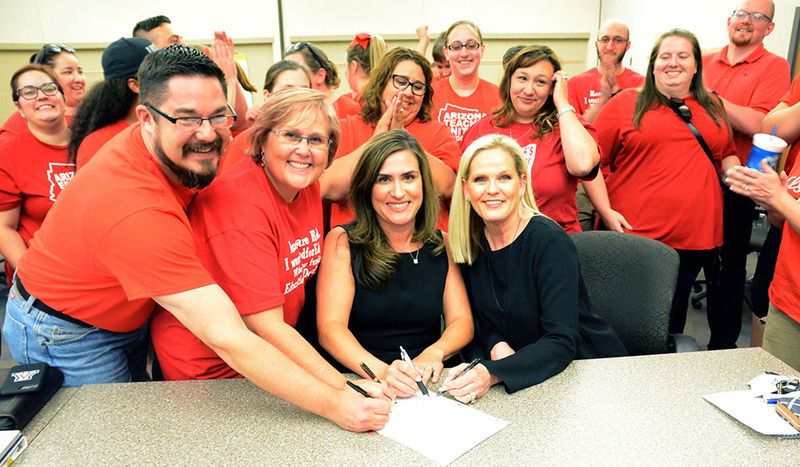 “[W]e support our school employees as they make their demands known for legislative action to secure the necessary funding for meaningful pay raises and education funding,” the resolution states. Before the meeting, teachers from MUSD and other local schools gathered at Copper Sky for a rally. They then created “thank you” cards to individuals and organizations that have expressed support. Two of the four board members present at Wednesday’s regular meeting also wore red. High school teacher Aidan Balt thanked the board for supporting teachers and student. Then she specifically thanking incoming superintendent Tracey Lopeman and the cabinet for communicating the walkout situation quickly to all families in English and Spanish. “I’ve never been more proud to be a teacher and I’ve been more proud to work for MUSD,” she said. Technology Integration Specialist Christine Dickinson thanked the classified staff of MUSD for their support, calling all of them educators. April 12, Gov. Doug Ducey proposed a 20-percent teacher pay raise by the fall of 2020, but state teachers voted to walkout instead, saying it did not do enough for support staff or per-pupil funding. Supporting Ducey’s plan, Senate President Steve Yarbrough said the teachers were victimizing the students.